Search Engine Optimization is a marketing practice that is focused on getting organic traffic from search engine results. The primary search engines that most people use are Google, Bing, and Yahoo. It is important to understand that when you are using these major search engines, you are not actually searching the web. You are searching that search engine’s index of the web. There are literally billions of pages that are indexed and stored by these search engines. There is no single factor that is most important to gaining rank in the search engine results. Being highly favored by Google and other search engines is a cumulative result of multiple components. 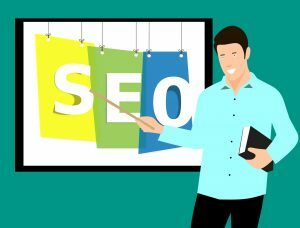 We are going to help you gain a basic understanding of what it takes to start seeing success with SEO as well as general guidelines to follow that can help you gain an edge over the competition. Let’s dive head first into the basics of what SEO is, why it is important to your organic search results, and your overall success online. Search engines are the virtual libraries of the internet. They scan and collect information on every single website. When a user makes a search, the search engine scans their database for every page that has those search terms. Search engines have machine learning systems that in turn make sense of all this information to turn it into relevant search results to get a user in front of the most relevant content. Over the next few years the machine algorithms will become much more advanced. Right now we are in the infancy of these advancements. Google is learning how to better understand and look at content so it is more important now than ever to learn the basics of SEO. A search engine’s only job is to return relevant and useful information for the searcher’s query. Make sure your content is high quality and relevant for your target audience! Hit Your Traffic Goals with Current SEO Methods. If you want to gain the approval of the search engine gods, make sure that you are providing high quality relevant content. Providing keyword stuffed content that is not very helpful to the user will not get you to the top of the search engine results. Your goal should be to create lots of high quality content that naturally targets interesting and relevant searched for terms. Links from trustworthy sites are valuable to establishing your website as informative and useful to your user. Your site has content that other valuable websites want to link out to. Building high quality links to your site is very important to being ranked favorably. Links from an authority website can be interpreted as votes that are in favor for your content. Google bots and crawlers will crawl your website via inbound links coming from these other websites. Google will look at that page and inventory how many external links point to your website. In general, the more quality websites link to that page, the more likely it will be ranked highly in search results. Google has recently started penalizing sites that use certain link building techniques and over optimization of links to try to rank higher. Create a useful, information-rich site, and write pages that clearly and accurately describe your content. Make sure that your title elements and ALT attributes are descriptive and accurate. Use keywords to create descriptive, human-friendly URLs. What are the most important things that you have to focus on to gain a solid foothold in SEO? A collection of positive factors will help increase your odds of favorable rankings. Every factor is important, starting from quality content to the HTML title and to authority. Presence of positive factors result in an increment of the odds of success and negative factors imply worsening these odds. People that are actively searching for what you have to offer via specific keywords are what we call “targeted traffic”. If you are able to successfully capture this traffic, it can make your business. Try to think of certain keywords that you want a specific page to be found for. Use these words in your title tags, and through your copy. It is a delicate balance to find the right keyword density in your content. Ranking for competitive search terms can be very challenging. It can be helpful if you already have a network to share new content with – a blog following, an audience on social networks like Facebook and Twitter, email contacts you can reach out to for occasional help with a link. Title-tags and description meta-tags are snippets of HTML code in the header of the website. “Title tags are used to tell search engines and visitors what any given page on your site is about in the most concise and accurate way possible.” – The tag itself is meant to give the accurate description of the on page content. Search engines will use the title meta tag to display the title of a search result. The meta description tag tells the search engine what your page or site is about. It is important that you write good descriptions of your pages to increase your CTR (click through rate). A well written description entices users to click as well as being descriptive. If you do not do this well enough, google’s bots will artificially do it for you. A webpage can be given a score based on its creation date. This is called the “freshness” score. This score can be responsible for boosting a piece of content for certain search queries, but will become less of a factor as the content gets older. Here is where you have the most control to determine how your content is viewed. What type of content do you publish? Your website architecture, titles, tags, and links all help search engines index your site. Good content is the backbone of a great website. People land on your site and are finding the solution to their problem. The longer your content is, the greater the chance that you can cover your topic from all angles. Long and useful copy can be seen as more valuable by search engines. This content needs to satisfy a demand and be linkable. If your content is not linkable, search engines will not rank it. With so much information for search engines to sift through, having on-site rankings is not enough. You do not have direct control over your off site page rankings. Some websites have tried to make their content seem more useful than it actually is. More information was needed to make sure that everyone gets a fair judgement. It is a generally agreed upon consensus that social media such as Facebook likes and shares, Twitter follower counts and tweets linking to your site and pages, as well as Google+ circles all play a favorable role in contributing to positive SEO signals. Online reviews from major review sites should be utilized. These reviews as well as social media can create valuable inbound links that can give you a boost in your off site SEO efforts. Before you can get your great content ranked for your target keywords, you need to make sure that your website is streamlined and user friendly. You can have great content that would do well in ranking for your target keywords, but if your website is slow or unresponsive search engines will ignore you. It takes a long time to gain traction in the search engine rankings. It takes considerable investment and time to start seeing a return on your investment. In general in might take up to 4-6 months to start to see results. These results will grow over time. There are a lot of factors that go into how long it will take to rank your website. Your efforts will compound over time and start to deliver you results. The payoff can be worth it for all this hard work. SEO can really boost your sales and establish you as an authority.